The O.C. Supertones bid you farewell. Even in writing this sad letter, we hold our heads high. We are proud of this band, our accomplishments, friendships, but mostly, we thank the Lord for what He has enabled us to do these many years. There were several reasons that factored into our decision. Rest assured, however, that after much discussion and lots of prayer, we believe this is the right path. Our end date is yet to be determined, but 2005 will be the Supertones' last year together. To our fans - you made us. You encouraged us day after day on the road, via letters as well as e-mails, through gifts and by your words. We are truly grateful to God for your support throughout the years. Sing as loud as you can back to us this last year. Let us hear your voices! There are others that have helped the band exist. Though some members have come and gone, they contributed greatly to The OC Supertones -- Jason Carson, Tony Terusa, Darren Mettler, Brian Johnson, Kevin Chen and Dave Chevalier. Thanks for your hard work and all that you gave during your time with the Supertones. To all our friends - thank you for years of affirmation and love. By God's grace, our friendships do not end with the life of this band. You all know who you are. Lastly, thanks to our amazing families -- wives, moms, dads, brothers, sister, etc. You have been our greatest encouragement through thick and thin, on and off the road, in and out of the band. We greatly appreciate your patience, tolerance and unconditional love. It has been our privilege and pleasure to play music while telling people about Christ. The Supertones are determined to make it a great last year. We would love to see you out at any of our shows. (NASHVILLE, Tenn.) Nov. 23, 2004: Renowned rock, ska band the O.C. Supertones bids a fond farewell to its long-lived career. Ten years, seven albums and millions of fans later, the group has decided to part ways in 2005. In a letter that recently posted to its website the band comments, "There were several reasons that factored into our decision. Rest assured, however, that after much discussion and lots of prayer, we know this is right. Our end date is yet to be determined, but 2005 will be the Supertones'last year together." The O.C. Supertones has summoned its fans for support in 2005, encouraging them to attend a live show. Among those events planned to mark the band's final year together are a greatest hits record, Unite, a national tour as well as select concerts abroad. Matt Morginsky, frontman for the O.C. Supertones and one of its founders, reflects, "It's both difficult and sad to say goodbye to something you have been a part of since you were 15. I hope that this band leaves behind more than what numbers can indicate. Our goal was and still is to glorify God and to edify His people." This last decade, the band's impact has gone beyond affecting its fans. "Working with the Supertones has been among the highest experiences of my career," remarks Mark Guynn, booking agent for the William Morris Agency. "Their musicianship is exceeded only by their ability to get a crowd going. This is going to be a great year for the Supertones. Bittersweet, yes, but we're gonna have a lot of fun too!" With more than one million album sales to its credit, the O.C. 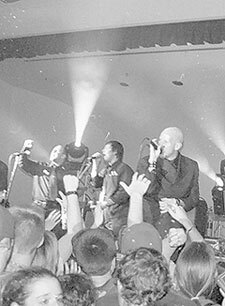 Supertones are one of contemporary Christian music's leading rock bands. The group has acquired two rock radio hits, played 19 concert tours, and performed at such high-profile events as World Youth Day with Pope John Paul II as well as numerous Billy Graham Crusades. Media appearances include MTV's 120 Minutes, CNN's Headline News and the cover of national touring magazine, Pollstar. For more information on the Supertones and its 2005 itinerary, visit: www.supertones.com. For booking, email mguynn@wma.com.